Keith Thurman vs. Danny Garcia: What's At Stake? Keith Thurman vs. Danny Garcia: What’s At Stake? Briggs Seekins March 3, 2017 Boxing, Headlines No Comments on Keith Thurman vs. Danny Garcia: What’s At Stake? 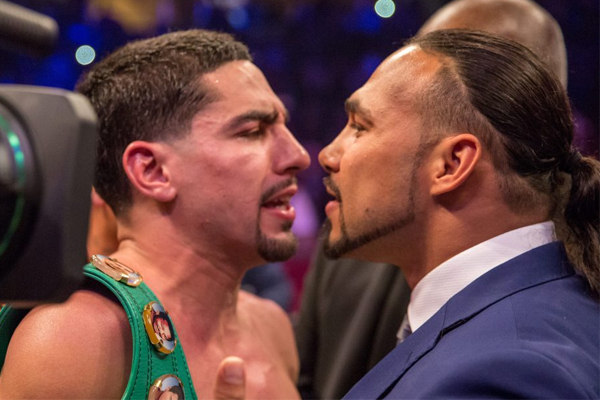 The winner of Saturday night’s bout between Keith Thurman and Danny Garcia will not be the “true world champion” of the welterweight division. You might hear somebody make that assertion over the next week, so it is important that those with regard for the truth call nonsense in advance. The winner will have two alphabet-soup belts, courtesy of the WBC and the WBA. But nobody can call himself the world champion at 147 pounds without beating the winners of Manny Pacquiao vs. Amir Khan and Kell Brook vs. Errol Spence Jr.
And anybody who compares Thurman vs. Garcia to the 1981 showdown between Ray Leonard and Tommy Hearns should be politely asked to shut the hell up. Garcia and Thurman are both 28 and neither has shown anything like the greatness Leonard and Hearns had both already displayed in their earliest years of their 20s. Nevertheless, Thurman vs. Garcia is a major fight. The winner will be the biggest star in Al Haymon’s PBC roster. Both men are undefeated, with quality wins over very good fighters. Garcia was a true world champion at 140 pounds. Thurman defeated a determined, top-five contender last June, when he handled Shawn Porter in one of 2016’s best fights. I have a hard time deciding who to pick in this one. Thurman has looked more flashy and explosive, but Garcia does have a jolting left hook that has delivered signature stoppages. Garcia has appeared a bit more well-rounded, but Thurman is certainly no slouch in the technical department. Garcia also has a habit of stepping things up and delivering in fights where he has been tabbed as the underdog. It is without question a risky fight for both men, which is what makes it so intriguing. But if forced to pick, I have to go with Thurman. I think he is the physically stronger fighter and has the ability to fight at range, which should make it tough for Garcia to land good counter punches, which has often provided some of his best moments. Still, I wouldn’t bet money I couldn’t afford to lose on this one.